Email marketing is one of the most powerful tools available to modern marketers. It is vital for most businesses. But what makes email marketing effective is changing in response to new technologies and new customer behavior. The truth is that many businesses may be able to keep using email as they always have and still generate a level of success. An online retailer can keep sending sale and special offer messages indiscriminately to its entire subscriber list and enjoy a sales boost. But the extent of that sales boost may be diminishing. This does not mean that email is, necessarily, losing its value as a marketing tool, but rather that email marketing techniques and approaches are changing. For many companies, events and dates drive email marketing. Subscribers receive a message because the marketer has a sale or a newsletter or even a new video on YouTube. 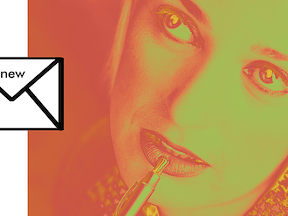 One might even go so far as to say the email is sent to fulfill the marketer’s need — a need, ultimately, to sell something. Think about recent holidays in the United States like Mother’s Day or Memorial Day. 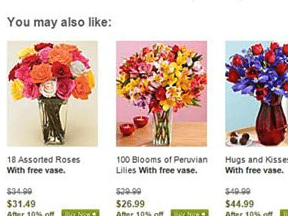 Many American shoppers received dozens of email messages offering one Mother’s Day special, one Memorial Day sale, or another. Given that shoppers see so many of these messages, it may be difficult to stand out in the inbox. Many marketers have already moved away from this approach, favoring instead sending emails based on the recipient’s behavior. Imagine, for example, an online retailer that sells fishing rods and gear. The company helps to promote its business with a fishing channel on YouTube and with a “10-days to Mastering Sturgeon Fishing” email series that the YouTube channel’s host promotes at the end of each episode. There is even a link in the YouTube description of each video that takes users to a registration page for the email series. When the potential customer registers for the series — a “behavior” in this context — a welcome email is sent. Then each day a new message from the series goes out. It includes a lesson in the body of the email, and links to resources and related videos. If a recipient does not open the email within 12 hours, which is another behavior, a reminder message is sent. At the end of the series, the customer receives a certificate of completion and a coupon. Notice that in this example messages are sent not in response to some date on a calendar, but in accord with the recipient’s action. Many companies already use this approach. But it will likely become more common and more important. Regardless of whether an email-marketing message is sent because of an event or an action, expect that message to be increasingly specialized. As an example, here is a personalized Best Buy email that I recently received. If you look closely, you can see that the message addresses me by name at the top. There is also a link to my account. But this is not really the point. Best Buy sent an email based on customer data. Rather, the point is that I recently bought a Keurig coffee brewing system. Best Buy is not randomly soliciting me. Rather, it is sending an email that is relevant to me. 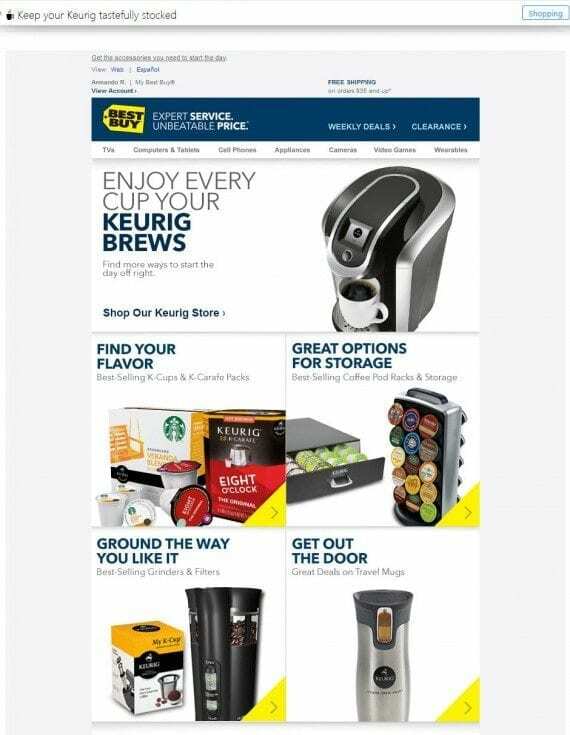 Put another way, Best Buy lets customer data, information it had about me, determine which email marketing message to send me. This sort of personalization and relevance works. Closely related to personalization is a change in how email marketing is tested. Think about the A/B tests many good marketers currently use to optimize email subject lines or even email message copy. There is a sense in which these tests are built to discover what works for the average, typical, mass-market customer. But email personalization, particularly data-driven personalization, is all about treating customers like individuals, not the average. Of course, testing will still be an important part of email marketing, but it may become relatively more complex and more powerful since marketers will be able to test around customer behavior, which can be far more specific and actionable. Test what works best for a particular customer rather than what works best for a typical customers. The majority of email messages are read on mobile devices. There are a number of recent studies that demonstrate this fact and, by extension, how important the mobile platform is for email. For example, it has been reported that 75 percent of Gmail’s 900 million users access their accounts on mobile devices. Separately, Moveable Ink, a content and marketing firm, estimated that 66 percent of all email in the United States is now read or at least opened on a mobile device. Although some email marketers seem slow to adapt, email marketing templates should be mobile first. Similarly, the so-called Internet of Things could further impact how email-marketing messages are presented. For example, some believe that Apple will sell more than 22 million Apple Watches this year. While the Apple Watch supports email, it only offers plain text with no links.